A former Chinese Communist Party official once tipped for a top leadership position has been sentenced to life in prison for bribery. 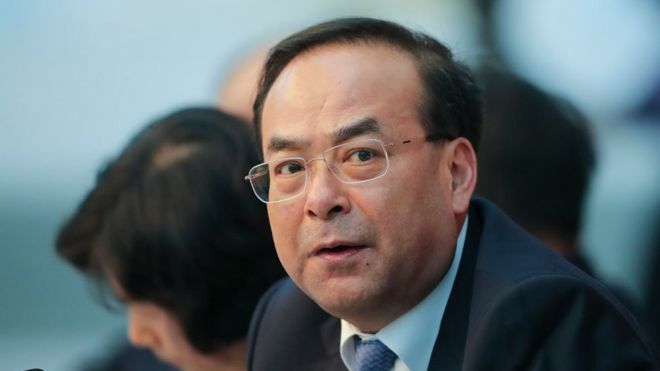 Sun Zhengcai, a former Politburo member, is the latest senior figure to fall in President Xi Jinping’s anti-corruption campaign. He was found guilty of taking bribes of more than $26.7m (£19.6m). The 54-year-old, also the former party chief of Chongqing, pleaded guilty to the charges in April. According to state media outlet Xinhua, Sun’s “illegal gains” would be confiscated. What is China’s new ‘super anti-corruption agency’? President Xi has made it his personal mission to tackle the widespread corruption in China. More than a million officials have been punished since he became president. But critics accuse him of using the anti-corruption campaign to silence his political opponents and rein in officials who challenge his position.